Nordic Skiing & Snowshoeing for the winter season is here for Trout Lake, Priest Lake, and Town of Telluride’s Valley Floor. Mountain Village grooms approximately eight miles of winter trails to create a quality surface for as many users as possible. Our winter trails accommodate skiers, hikers, snowshoers and bikers as well as dogs who are accompanied by a responsible dog owner. We do ask that foot and bike traffic stays to the sides of the trails, off the classic grooves. The following trails are part of the Winter Trail System. 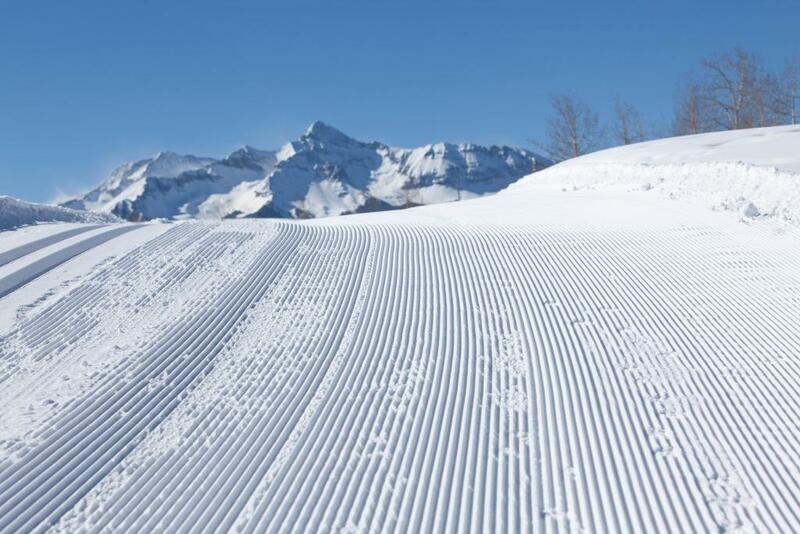 Each one is interconnected, starting at the Telluride Valley Floor via the Boomerang Trail and continuing up to Mountain Village’s winter trails, which are located on the Telluride Ski & Golf Company’s golf course. These trails reach into Mountain Village Center and extend out to the Mountain Village entrance. Please review our Nordic and Snowshoe Trails Map to help navigate our trail system. For your convenience, there are multiple access points to our winter trails. If you are driving, you may access the trails from Adams Ranch Road, 100 yards north of the intersection at Mountain Village Boulevard where there is free parking along the roadway. Or if you’re in Mountain Village Center, access is available from The Peaks Resort and The Peaks ski trail, at the top of the chondola. For those in need of classic or skate skis or snowshoes, visit one of our local retail sports shops. And after you are done, come relax next to one of our fire pits in Mountain Village Center. Explore areas of the Telluride Ski Resort that are inaccessible on skis or a snowboard. Their group and private snowshoe tours cater to all ability levels. Advance reservations for snowshoe tours and rentals are highly encouraged due to limited availability by (970) 728-7433 or email. MV Nordic trails are in good spring skiing condition. We may continue to groom throughout the next week if we get the snow that’s forecasted. Thanks all for a great season!! All MV trails groomed and classic set.